Serge Sabarsky, New York (no. 12.4616), by whom acquired from the estate of the above after 1964. Acquired from the estate of the above by the present owner in 2003. S. Sabarsky, Egon Schiele, Watercolours and Drawings, 1983, no. 25 (illustrated p. 90). H. Dichand, 'Er enthüllte die Macht der Erotik', in Pan, July 1986, p. 38. J. Kallir, Egon Schiele: The Complete Works, London & New York, 1998, no. D1482 (illustrated p. 521). Possibly Vienna, Graphische Sammlung, Albertina, Egon Schiele. Gedächtnisausstellung, 1948, no. 195. Munich, Haus der Kunst, Egon Schiele, February - March 1975, no. 209 (illustrated). Vienna, Historisches Museum der Stadt Wien, Egon Schiele: Zeichnungen und Aquarelle, September - November 1981, no. 85 (illustrated); this exhibition later travelled to Linz, Neue Galerie der Stadt, November 1981 - January 1982; Munich, Villa Stuck, spring 1982; Hanover, Kestner-Gesellschaft, April - June 1982.
exhibition later travelled to Milan, Accademia di Belle Arti di Brera, March - May 1984. Palermo, Villa Zito, Egon Schiele, vom Schüler zum Meister (new leg of the Vienna exhibition), February - April 1985; Tel Aviv, Museum of Modern Art, April - May 1985; Hamburg, Kunsthalle, May - July 1985; Salzburg, Rupertinum, July - September 1985; Graz, Schloss Plankenwirth, October 1985; Innsbruck, Tiroler Landesmuseum Ferdinandeum, January - February 1986; Bottrop, Josef Albers Museum, February - April 1986 and Nurnberg, Kunsthalle, April - June 1986. Martigny, Fondation Pierre Gianadda, Egon Schiele (new leg of the Vienna, 1984 exhibition), November 1986 - January 1987. Charleroi, Palais des Beaux-Arts, Egon Schiele, September - December 1987, no. 87 (illustrated). Martigny, Fondation Pierre Gianadda, Schiele, February - March 1995, no. 95 (illustrated p. 161). New York, Neue Gallerie, Egon Schiele: The Ronald S. Lauder and Serge Sabarsky Collections, October 2005 - February 2006, no. D117, pp. 416 & 417 (illustrated p. 281). Bildnis einer Frau mit schwarzem Haar (Portrait of a Woman with Black Hair) is one of a small group of formally powerful gouaches painted in the spring of 1914 in which the boundaries between Schiele's painting and graphic styles become blurred. Following on from this pronounced tendency in his work towards the latter part of 1913, in his first studies of 1914, Schiele experimented with a new intensity of brushwork, texture and sense of surface in a series of portraits of very striking but unknown models. 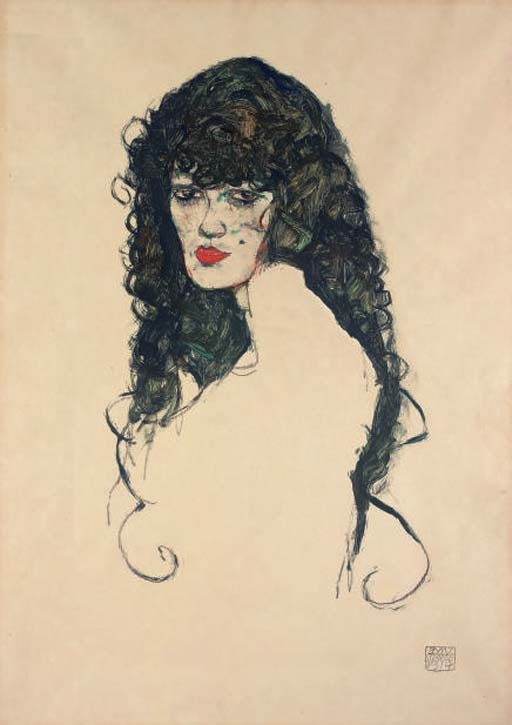 The model for this work, though clearly not the same person, recalls another unknown model with thick long black hair that Schiele had been fascinated with in 1911 and who, ultimately, had led to the creation of an important and now lost oil painting of her. In Bildnis einer Frau mit schwarzem Haar, Schiele, using a mixture of gouache, watercolour and black crayon, has captured a similar smouldering intensity with this raven-black haired woman whose provocatively seductive gaze stares directly out from the page. Rarely for Schiele, the complete form of this woman has been delineated almost entirely without line. With a magnificent command and assuredness Schiele has built her form in a painterly way from a combination of intensely dark angular brushwork applied onto thick paint with a dry brush contrasted directly with the bleak emptiness of the blank page. This almost blocking technique of dense opaque form opposing nothing, in such a way that it creates a sense of fullness and volume from the emptiness of the page, is one that closely echoes that of the masters of the Japanese woodcut who Schiele greatly admired. Employed here in this work, it has the affect of transforming a study into a seemingly complete portrait in its own right.